Breaking a long-standing jinx, SSP Chawrasia finally clinched the Hero Indian Open title with a two-stroke win and also secured his Full European Tour card at the Delhi Golf Course. 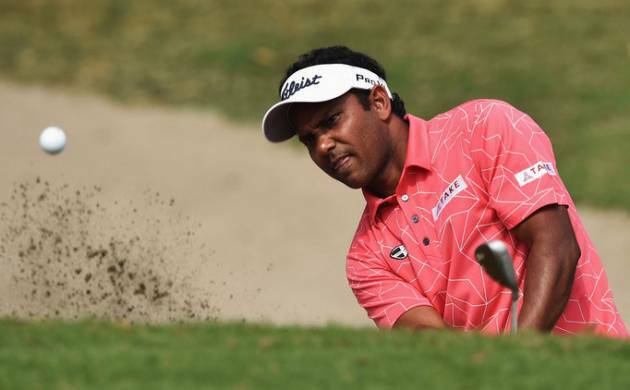 Chawrasia, who has ended runner-up here four times in the past, came up with a sedate one-under 71 in the final round to edge out defending champion Anirban Lahiri (69) and Korea’s Jeunghun Wang (68) by totaling 15-under 273. With this win, the 37-year-old pocketed a winner’s cheque of USD 276,660 and moved to the fourth place in the Asian Tour Order Of Merit. “This is a very important win as I don’t have a full card. Hopefully I am playing Olympics and World Cup so it is important. I am happy. I was nervous a bit today but I focused and breathed in and out and control my nerves,” Chawrasia said. Among other Indians, Rashid Khan (72) finished tied sixth at 10-under 278, while one stroke behind was the duo of Shiv Kapur (70) and Rahil Gangjee (72) at tied 10th. Arjun Atwal (73), who turned 43 today, and Jeev Milkha Singh (68) finished tied 20th and tied 23rd at 281 and 282 respectively. Last year, Chawrasia was in a similar situation when he was leading by two shots going in the fourth round but DGC bared its pangs and he shot a horrendous 76 even as Lahiri forced a play-off and eventually clinched the trophy. Lahiri once again made a rampaging start to the final round as he blasted a hat-trick of birdies in the first three holes and caught up with Chawrasia when the Kolkata pro dropped a shot at the sixth hole. Chawrasia, however, picked up a stroke at the 8th and Lahiri dropped a shot at the ninth to slip two strokes behind the overnight leader. At the back nine, Chawrasia dropped a bogey at the 10th but recovered with a birdie at the 13th. Meanwhile, Jeunghun Wang slowly climbed up with three birdies in the front nine and then a birdie at the 14th took him to 13-under, just one stroke behind Chawrasia. At the 14th hole, Lahiri gained another stroke and joined Wang after both his and Chawrasia’s tee shot ended up in a bunker. While Lahiri managed to hit a birdie, Chawrasia saved par. At 17th hole, Wang was left cursing his luck when his birdie putt slipped out while Chawrasia and Lahiri once again saved a shot. Wang came up with a wayward second shot at the 18th but it rebounded off the trees into the fairways. However, he could not make use of it, missing a birdie putt to stay at 13 -under. With just one hole to go, Chawrasia slightly hobbled with his approach shot which landed on the left of the fairways but the Kolkata golfer’s next stroke took him close to the pin and it attracted applauds even from Lahiri, who had to take a free drop. With Lahiri next missing a birdie putt, Chawrasia sealed the title with a birdie.